As in many areas of life at Twin Lakes, the vast diversity of backgrounds, experiences, and interests of our residents is a key factor in the comprehensive array of programs we offer. 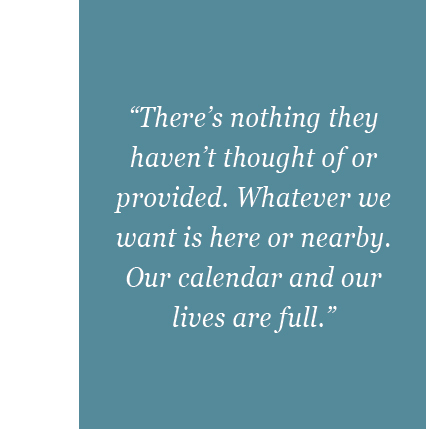 Our wide range of amenities and services creates a community where people of all types thrive. Folks often say we have it all; everything they want or need for the independent life they want to lead. Our modern facilities afford attractive community spaces for a full-range of activities, dining, and entertainment options. And, in some cases, no environment is better than the great outdoors where our gorgeous 218 acre campus provides the perfect setting for picnics, walks, fishing in one of our lakes, or just enjoying time with family and friends. Resident’s social and activity calendars are as busy or laid back as they want them to be. No matter what stage of life you’re in, Twin Lakes provides the setting for you to live your days enjoying what matters to you. 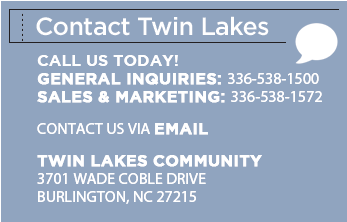 Contact us today to learn more about senior independent and assisted living community options here at Twin Lakes.